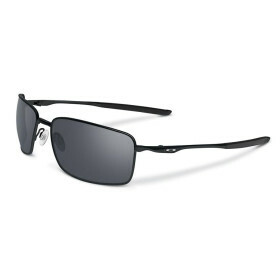 Oakley Square Wire (Polished Blk/Blk Iridium) » Protective Solutions, Inc.
Oakley reinvented their classic Square Wire™ eyewear, creating a fresh look of casual sophistication that still brings the best of comfortably lightweight C-5™ alloy. The nose pads are adjustable for a made-for-you feel, and Unobtainium® earsocks increase grip with perspiration to maintain a secure Three-Point Fit. Square Wire offers the wide peripheral view of 8.75 base lens curvature with High Definition Optics®, including XYZ Optics® to extend clarity all the way to the lens edge. Dimensional sculpturing gives the earstems a whole new look of refinement and originality, and Square Wire is just as much science as art. Five metal compounds are combined in a blast furnace to produce durable C-5 alloy. When you feel the comfort of its low weight, you’ll appreciate the effort. As far as performance and protection, Square Wire meets all ANSI Z80.3 standards for optical clarity and impact resistance, and of course our Plutonite® lens material filters out 100% of all UVA, UVB and UVC. For glare reduction and balanced light transmission that tunes your vision for a specific environment, choose a lens with Iridium® lens coating.